What an opportunity. 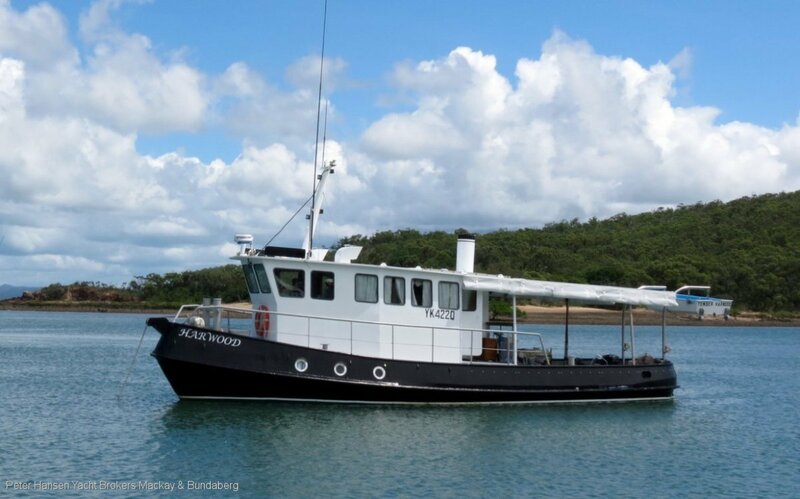 Lovingly converted Tug Boat - 6 cylinder Gardner diesel engine, 11kw genset, solar panels, GPS, auto-pilot, sounder, radar, radio x 2 (HF + VHF), TV, Stereo, tender with 2.5hp outboard, shower, toilet x 2, stove, microwave, fridge, freezer, air-conditioned. Bilge keels enable the vessel to be beached - this is the perfect vessel for someone looking for an incredibly solid coastal cruiser, oozing with character and not a thing left to do but enjoy! Harwood was built in 1964 for the Harwood sugar mill in Yamba to pull the barges on the Clarence River, she was then refitted as a working tug with accommodation for commercial dock building and marker bouy servicing. In 2016 she was completely refurbished by the current owners from a working tug to a very comfortable live aboard tug with a forward cabin below with en suite basin and toilet. She has been used to cruise the Whitsunday islands for the last few years. She cruises well on 7knots and is extremely economical. She has had bilge keels put on her making it possible to go into anchorages to dry out if necessary. On the top deck is a shower and toilet. Her aft deck is completely covered with custom made clear plastics which protect you from the weather while entertaining friends on the very spacious aft deck. She is reluctantly for sale due to medical reasons of the owners.